I crocheted my first bag ever... pretty cool huh? So where did I get the pattern? I used the free Sunny Shell Purse on Ravelry. This pattern was a little harder to use than I expected. My first attempt didn't turn out so well. The pattern calls for only 4 double crochet stitches for each shell and mine ended up a bit misshapen that way. It works so much better to use 5 double crochet stitches for each shell. Cute! Good work adapting the pattern to what worked better for you. Doing that requires a whole new level of expertise! 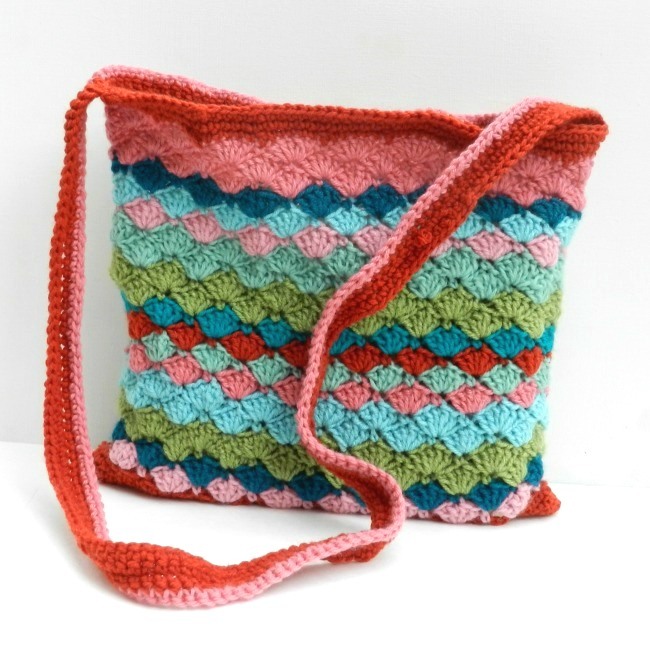 Hi, I love this bag that you crochet! I is so colorful and pretty. I saw it on wow me wed. Ah!!! I am so jealous!!! I tried crocheting a year or two ago and it did not go well. I was so motivated and excited to learn that I was very disappointing when I couldn't get it down right. Even tried loom knitting. You're bag turned out so cute. I love all the pretty colors you used. Congrats! I love it!! This is your first crochet project?!! So cute. Your colors look great together. Your bag looks great! The colors really do look good together. Too much fun. Can't believe it's your first bag!